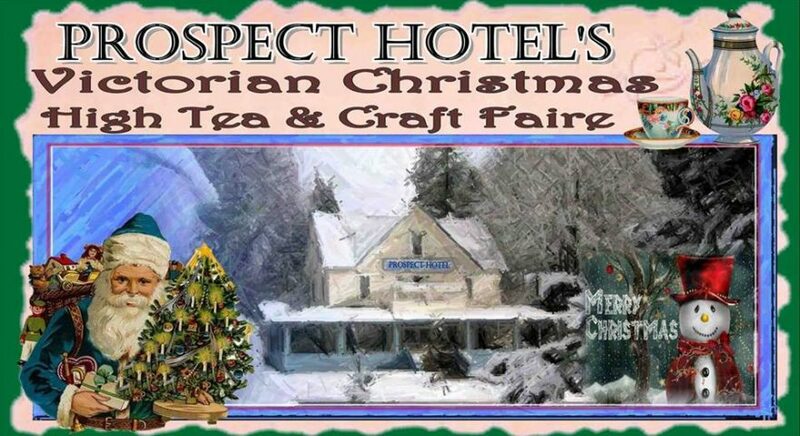 Victorian Christmas Faire and High Tea, hosted by Prospect Historic Hotel, Saturday and Sunday December 8th and 9th from 11am to 3pm. The proprietors invite Christmas and Victorian artists to display their wares in rooms decorated in period specific themes. Join this fun and unusual event for a day at the Prospect Hotel! Guests are welcome to “get into the era” by wearing Victorian or Christmas finery. Each of the rooms in this Nationally Registered Historic Hotel is decorated in period specific themes. Christmas and Victorian themes abound. The High Tea will be offered throughout the day in the Historic Hotel Dinner House. Take this opportunity for a day out to enjoy the Prospect Hotel all ‘Dressed Up’ for Christmas, to relax in high fashion while partaking in some of Karen’s delicious homemade tasties, and to find just the right gift for Christmas! Be it for someone else or just for yourself! Local craft and art vendors will have their own Historic Hotel Room decorated displaying their wares. Join this fun and unusual event for a day at the Prospect Historic Hotel! Guests are welcome to “get into the era” by wearing Victorian or Christmas finery. Reservations are HIGHLY suggested for the High Tea! Live musical entertainment all day. This promises to be a fun event! Oregon Bed and Breakfast Guild is ready to share Oregon with you: it’s environment, culture, and heritage. Combine gracious hospitality with ambiance at an inspected and approved Oregon Bed and Breakfast Guild member Inn.